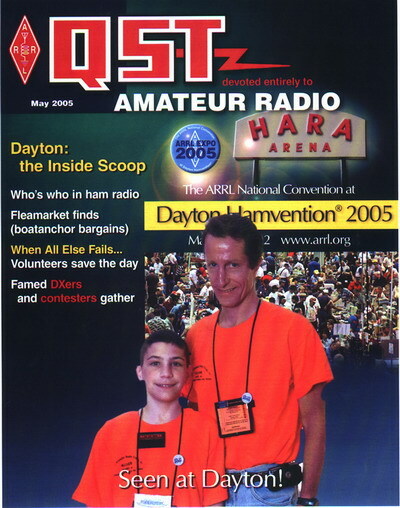 We are at the 2005 Hamvention in Dayton Ohio as part of the AARC Jr. (KI3DS). Sean KB3KXW has been invited to speak at the kids youth fourm on 5-21-2005. We arrived on Thursday 19, 2005 and it was "an adventure!". All was well when we left the DC area at 3:00pm and then after meeting up in Western Maryland we stopped at our first gas stop. Then a member said that his car was running on 2 less cylinders and we continued. Then we were stuck in an 1 1/2 hours in road construction. Then came the rain, and do I mean rain! I could barely see the road but I just followed the faint tail lights in front of me. We finally arrived at our hotel at about 1:30am! They say half the fun is just getting there! This was our first day at the hamvention and we all had a great time. The weather held out and we all enjoyed the out tail gating and the indoor exhibits. We enjoyed meeting the other hams and ARRL and the radio manufactures displays. Bob (AA3RR) was a featured speaker at one of the forums. When we were done at the hamvention we met at the Steak & Shake for dinner. Today we went to the youth forum and Sean gave a great speech and there were many other good speeches too. Everyone had a great time and they had a very good raffle. Today Icom took the wraps off their newest radio the IC7000. The weather was picture perfect and this will be a day to remember. A big thank you to Bob and Brenda for all their hard work in making this whole trip a possibility and the making Sean's speech happen. We appreciate all that you do!